"Piper's" beauty is much more than skin deep; she is loving, but SASSY! Her movement in the ring is something to behold when she struts her stuff; she moves with great confidence and pride. "Piper" is definitely "spreading the word," and is true to her registered name. 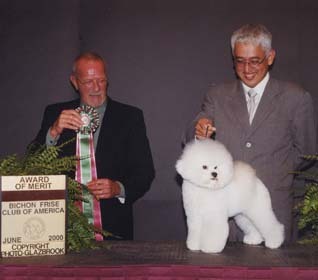 She is one of the five that were given the recognition of an Award of Merit at the Bichon Frise Club of America National show in 2000.